Balancing the risks associated with restoring the world’s masterpieces and frescoes is an art in itself. But a mixed group of experts from Italy and Spain demonstrate that injecting a bit of life — in this case, bacteria — into a painting can work wonders in removing unwanted features a piece gathers over time. Jesus wept” is, by some definitions, the shortest verse in some Bible translations. But what does it mean and what is its context? Los Angeles — A 780-year-old religious relic of St. Anthony of Padua has been stolen, and parishioners at a Southern California Catholic church are praying to the patron saint of lost items and missing persons for its speedy return. Magana said the relic is invaluable and deeply symbolic to his parish. The last time it was on view was eight years ago, to celebrate the 100th anniversary of the parish. In Catholicism, relics are usually part of a saint’s body or clothes and revered as a physical connection to the saint. UPDATE: It’s back and the thieving scoundrel has been caught! A surveillance video provided the break that led to the arrest of a Long Beach woman in connection with the theft a 780-year-old religious relic, police said Thursday night. The video footage from a camera at a nearby business showed a woman walking to St. Anthony’s Catholic Church on 6th Street during the early morning. The relic of St. Anthony — a bone from his body — and the 16-inch case, or reliquary, that houses it were reported stolen Monday. Police arrested Maria Solis, 41, Thursday on suspicion of grand theft and burglary, said Sgt. Rico Fernandez of the Long Beach Police Department. He told The Times that investigators found other religious relics inside Solis’ apartment that may have been stolen from churches. The priest at St. Anthony’s said Thursday night that the prayers of hundreds of people had been answered with the return of the relic, which was not damaged. Police said they had not determined a motive for the theft. Solis was still being questioned by detectives Thursday night. And why is it appearing every time I post something, at will, anywhere in the text? NATO refused to say Tuesday whether or not it would bomb ancient Roman ruins in Libya if it knew Moammar Gadhafi was hiding military equipment there. “We will strike military vehicles, military forces, military equipment or military infrastructure that threaten Libyan civilians as necessary,” a NATO official in Naples told CNN, declining to give his name in discussing internal NATO deliberations. 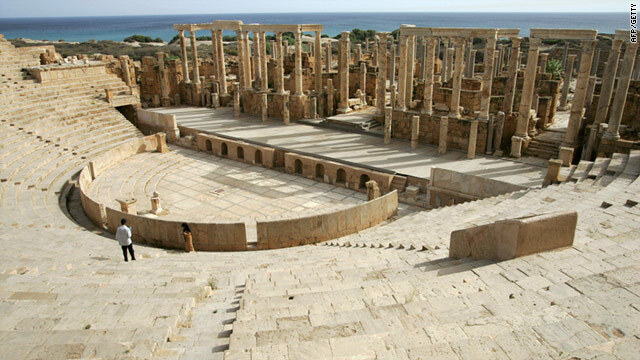 But he said the alliance could not verify rebel claims that Libya’s leader may be hiding rocket launchers at the UNESCO World Heritage site of Leptis Magna, a historic Roman city between the capital Tripoli and rebel-held Misrata. I mentioned his comments here.